REC.VC RTMP recording will capture any quality received, so if you send 720p, 1080p or 4K, it will be recorded and stored in the original quality. 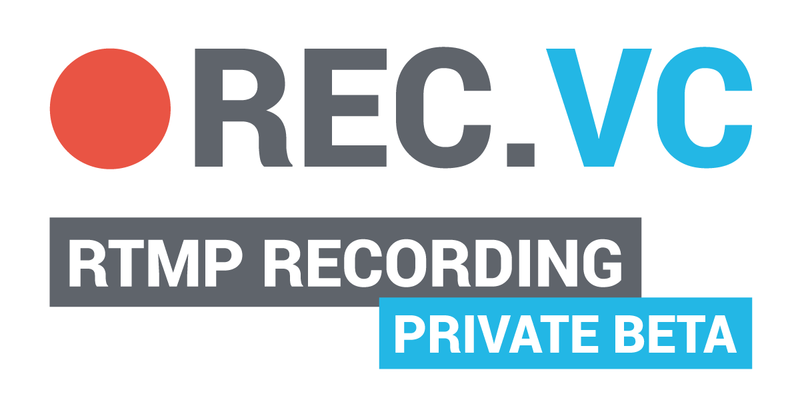 To test the REC.VC RTMP Recording feature in Private Beta, please email support@rec.vc with your recorder SIP URI to receive information on how to use the RTMP recording feature. New to REC.VC? Sign up for a free trial and we’ll notify you when we move to public beta. We appreciate your help in testing this new feature! We are excited to announce a new release of REC.VC with new functionality making it easy for users to trim their videos directly in the REC.VC user interface. The new video trim editor provides a visual interface enabling users to highlight the area of the recording they want to keep (blue) while the remaining areas (white) are to be removed. A new video will be created when the APPLY button is clicked and the original video will be kept unless the user has checked the Delete original video option. Did you know that you with REC.VC can chose between 18 predefined recording layouts for when you record a videoconference meeting? 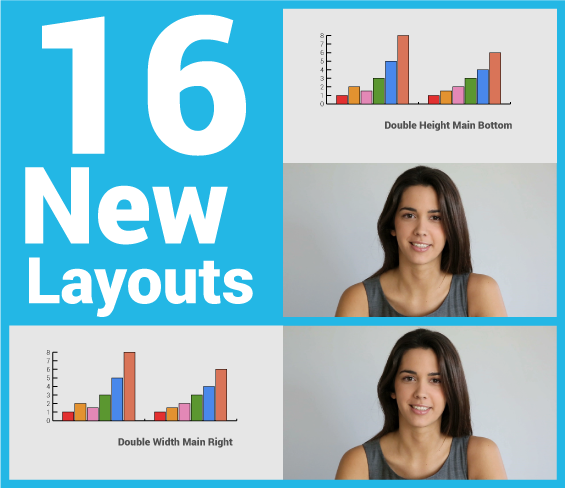 The layouts are different ways to mix the video and the content presented in the meeting. You may watch the demo below (posted on LinkedIn) or experience the REC.VC native playback experience of the same video clip. Please feel free to sign up for a free REC.VC trial account today! 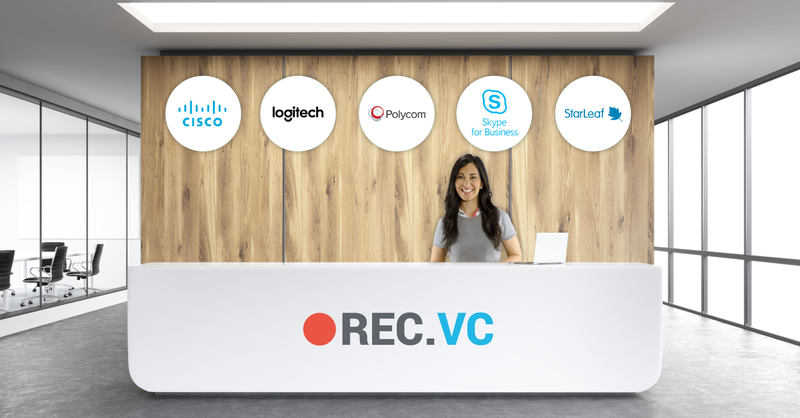 We are excited to announce the release of 16 new REC.VC layouts providing users with greater flexibility for mixing of content and people when recording & streaming their video calls, training sessions or town hall meetings. 14 layouts provide users with a regular 720p (1280×720) recording & streaming. 2 layouts provide users with special 720p x 2 recording for maximum quality, either as the Double Width layout (2560×720) or the Double Height layout (1280×1440). During live streams, these layouts will be scaled down to regular 720p format. How to enable or change a layout? If you do not have admin permission, please contact your REC.VC Admin User or email support@rec.vc to request a Video Layout for your account. * Technical: When BFCP is enabled, REC.VC will receive two streams from the remote side (content + people) and mix according to the selected Video Layout. For customers on the rec.vc domain, or for customers with Recorders registered to own VCS, the VCS will do the interworking between H.239 (H.323) and BFCP (SIP). Feel free to contact support@rec.vc with any questions or comments. We believe organizations can increase the value its collective wisdom by recording and sharing meetings, workshops and training with the rest of the organization. 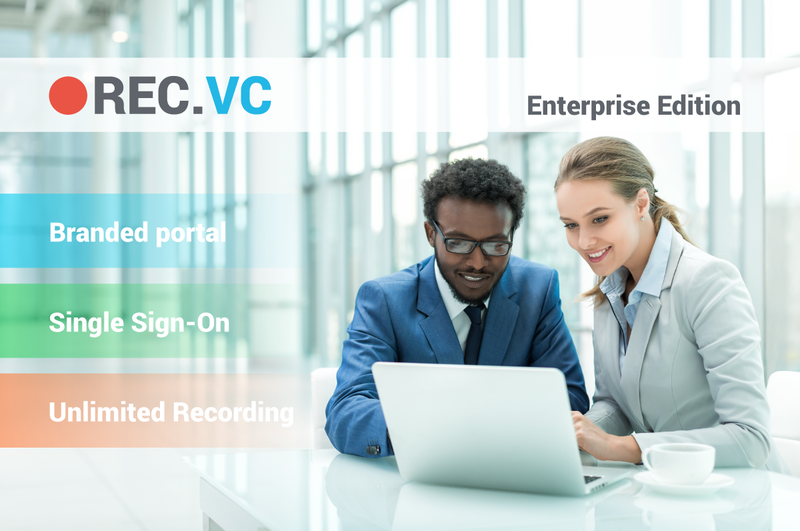 The REC.VC Enterprise Edition enables organizations to empower any employee to record & share, and optionally live stream, directly from their desktops, video conference endpoints or virtual meeting rooms. SIP, H.323, Skype for Business, and Chrome, are all supported. SSO is based on REC.VC’ support for SAML 2.0 which enables integration with any SAML 2.0 supported authentication source. Please feel free to contact sales@rec.vc with any questions. Enter the SIP URI of your Cisco WebEx room (typical URI structure is <alias>@<company>.webex.com) and the PIN code (if your room is PIN code protected), and click on the red record button. REC.VC will then call to and join your Cisco WebEx room as a passive participant and start recording. In the REC.VC interface, switch Mode to Stream & Record and select the appropriate Stream. 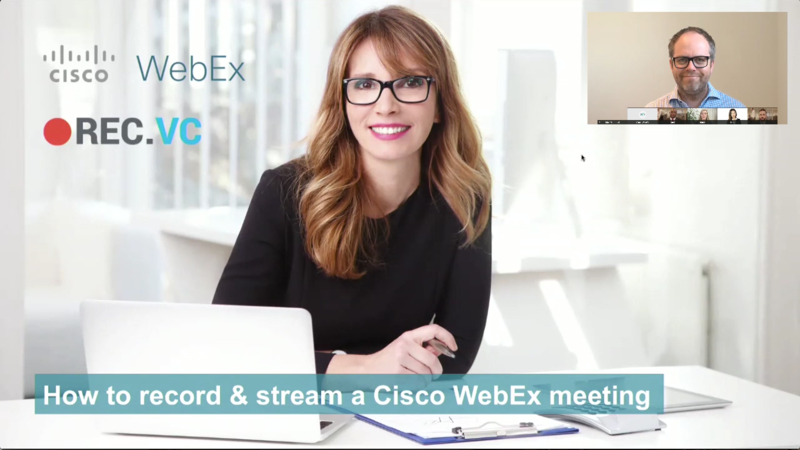 Then enter the SIP URI of your Cisco WebEx room (typical URI structure is <alias>@<company>.webex.com) and the PIN code (if your room is PIN code protected), and click on the red Stream button. 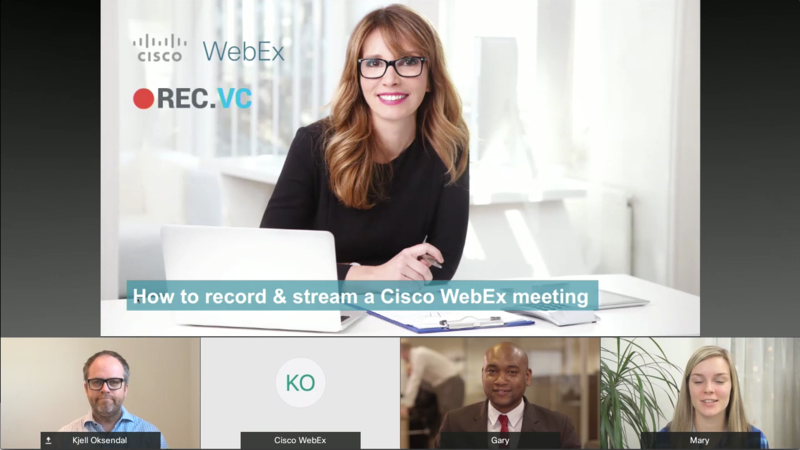 REC.VC will then call to and join your Cisco WebEx room as a passive participant and start streaming and recording. 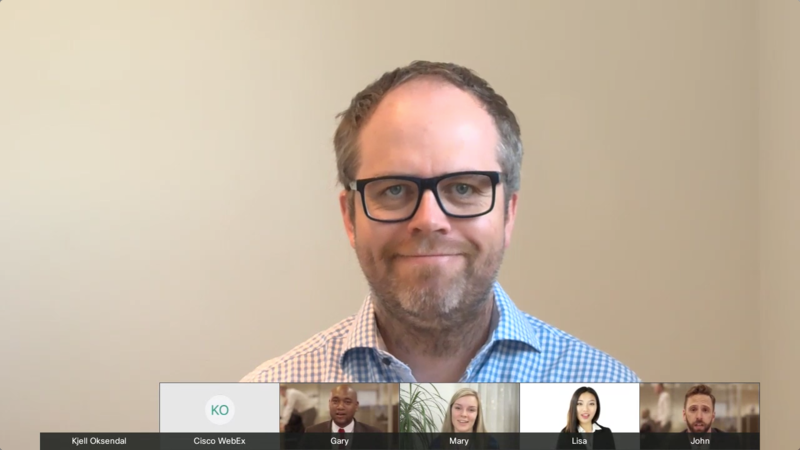 Top stop recording (and streaming), all you have to do is to disconnect the video call between REC.VC and Cisco WebEx, either by using the stop button in the REC.VC interface, or by disconnecting REC.VC via the Cisco WebEx participant list. 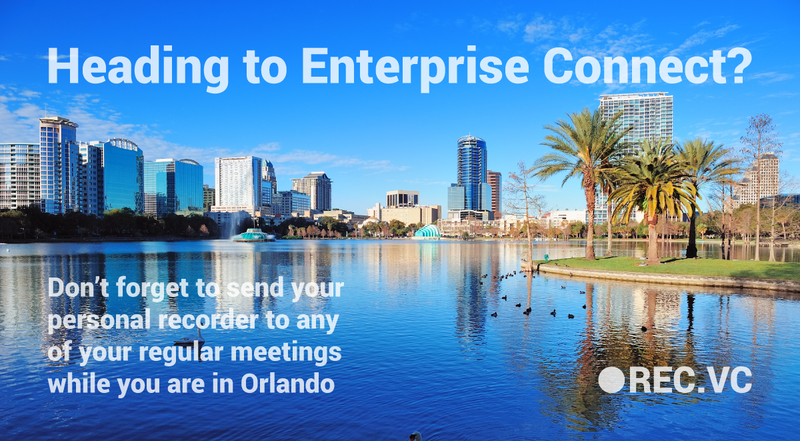 And pls don’t forget to send your personal videoconference recorder to any of your regular meetings while you are in Orlando. If you’ve deployed a video collaboration (VC) platform within your company or are considering doing so you know that it is a major investment. There is of course the monetary aspect of the investment but other items that need to be considered include the time required by support staff to plan and deploy the solution, training your users, and the ongoing support and maintenance of the platform. All in all you are looking at a lot of time, effort, and money spent in launching a collaboration service for your company, so wouldn’t you want to get as much out of it as possible? One aspect of VC that can sometimes be overlooked is the ability to record and stream over video. No matter what kind of video deployment you have, from fully loaded conference rooms with dedicated hardware endpoints to end users equipped with cost efficient webcams; all of these items are already recording and streaming ready. You have enabled your organization with VC because you believe in the value that collaborative sessions create for your organization. By recording (and optionally streaming) the same sessions, you further increase the value of your collaborative teams by making the collective wisdom available to the rest of your organization. Videoconference recording & streaming is available in the cloud, making it very easy and cost effective to implement and consume across your organization. Spontaneous video congratulating your team or company on a job well done. Update your dispersed team on a project item or milestone. Personal thank you to a colleague for their assistance. Record the interviews and share with relevant stakeholders internally, or simply go back to the recording when reviewing and comparing the candidates after each interview round. Remote recordings or streams via a mobile device in the field. Recording fun skits, songs, or jokes for your next company party or simply just to make things more fun. These items mostly touch on recording, while streaming has a multitude of use cases on its own. Company all hands meetings are a clear focus here. With businesses wanting to provide their employees updates on company performance and changes the best method is streaming. Gone are the days of trying to get the entire company onto a call, trying to overcome numerous connection and audio issues, and the expense of such an event. Streaming is the clear winner here for ease of use (for the broadcaster and the viewer), cost, and support required for broadcasting an event. Other use cases for streaming include investor calls, webcasts/webinar replacements, live instructional training, internal executive announcements, and more. Taking a look at this list, if you have a VC deployment, all your rooms with a video unit and all your users have already have these items. For rooms with video hardware, your nice camera is covered along with your mics. VC hardware has advanced in leaps and bounds over the last few years and even if your video unit is a few years old, it is likely you have a high quality camera with a good mic system connected to it. With a cloud recording solution everything is already in place in terms of gear, all that’s needed now is to dial an address and you are recording, and it doesn’t require a videographer or IT personnel to do so. Taking it a step further, any video enabled user has the same capability. Computer based webcams are inexpensive while providing high quality video and decent audio along with wired or bluetooth mics that can enhance audio even more. It is likely that most users already have both of these items, making them not only able to record or broadcast, but do the same from almost anywhere since this equipment can be mobile. The above primarily discusses recording, but the same benefits are also true to streaming equipment. In the past, to stream live video it would require servers dispersed across your organization to transcode and serve media to viewers. The bigger the organization, the more hardware required for a good experience. There were network implications that needed to be considered to have hundreds or thousands of viewers of a broadcast as well as additional considerations for anyone who might want to watch from outside of the internal company network. The cost to run and maintain such a deployment could be a daunting task requiring the time of many IT professionals. With cloud streaming all of these worries are out the window. A VC deployment in place with a cloud streaming solution alongside, beginning a stream is a simple as dialing an address and sending out a link. IT doesn’t need to worry about anything but making sure you can call from your VC room or software client. No more servers to maintain, bandwidth or QoS considerations to worry about, or concerns about media reaching remote locations. This is all taken care of by the provider. Again, all the equipment you need to worry about is most likely what is already in place and well supported. If your business has a VC deployment or is planning to launch one, you already have most of the hard parts of a recording and streaming solution in place. The final piece is a very affordable and easy-to-use cloud service that can be enabled and deployed in a very short time. This can breathe new life into gear that might not be getting much usage or bring added benefits to an already well used deployment. The only next steps you might want to think about are giving proper info on how to use the service. 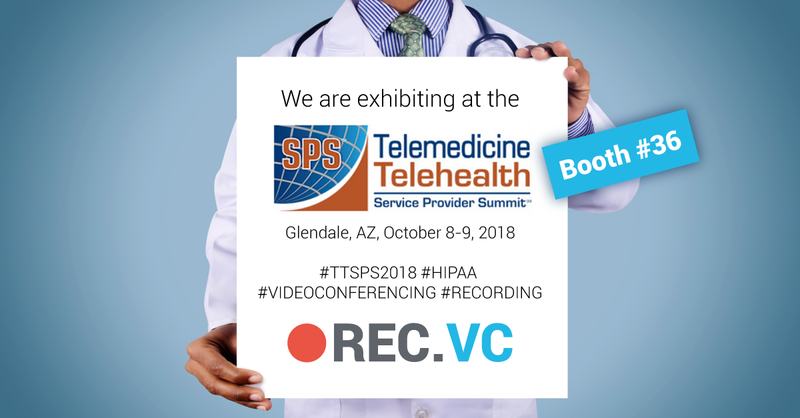 Since dialing an address is simple not a whole lot has to be done there but giving insight on how users can manage and send out their recordings is definitely important. Lastly it is always a great idea to provide some general tips when it comes to recording and streaming. Lighting and decent background – If you’re in a conference room, odds are your lighting is already good. However it is a good idea to make sure people know that there shouldn’t be a bright source of light behind them. This will wash out the video. 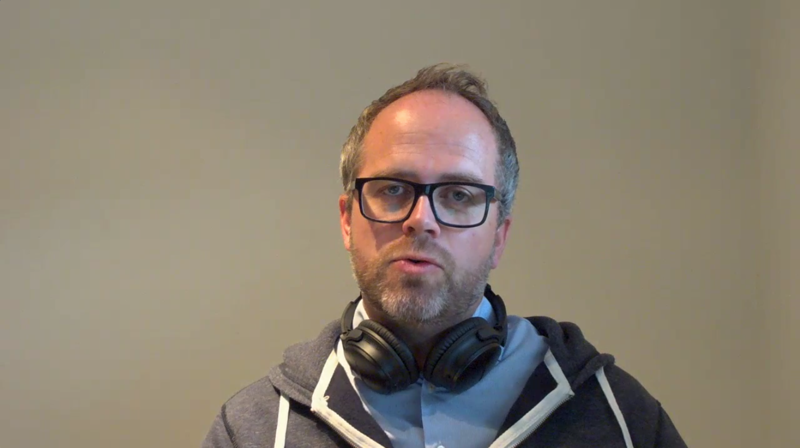 Having a nice background really helps make a video recording or broadcast shine. Try to avoid reading from a script – If you’re recording a video message to send out, reading from a script is usually a no-no. It can make speech seem robotic and disconnected. If anything have major points listed on a sticky note for inspiration. Try to speak naturally like you were actually talking with someone in front of you. Look into the camera – This one is often overlooked. It is very hard to do but if you look into the camera when recording or streaming it makes it seem as you are looking directly at your audience. A small detail that will make a bigger impact in your recordings. Show things! – This is something that can make things a little more fun. Since you are on video you have the ability to make things interesting by showing things to your audience. This could be a souvenir that you got on a vacation or simply something you enjoy that might spark a connection to bring your audience closer. Through video you can make things more interesting in a number of ways so think about how you can make your calls, recordings, and broadcasts more interesting. Happy recording and streaming to you!